Join us for three months of fantastic, diverse posts from YA Shot author interviews and guest-posts to a wide range of articles blogging & vlogging, about getting started in the publishing industry, reading, creative writing and celebrating literature and libraries. To find out more about our authors, check out the Author tab or our GoodReads List. To join the True Fire Readathon, meet other people going to YA Shot and generally talk about YA and MG books, join our GoodReads Group led by Virginie of La Chouett and Michelle Toy of Tales of Yesterday. There’s also a general Readathon led by Michelle of Fluttering Butterflies: see a vid about it here! Stop #5 (August 15th) – Vid-post with CJ Daugherty by Luna of Luna’s Little Library AND a vid-post of Luna’s own Bookish Dares! Stop #6 (August 17th) – Kate of If These Books Could Talk interviews David Owen PLUS enter the competition to win one of two copies of David’s debut, Panther! And check out Chrissi‘s review of Aoife’sToo Close to Home! 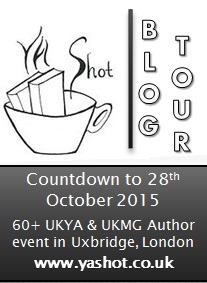 Check out Elena’s booktube vid – part of the YA Shot Readathon organised by Michelle! Check out Cora of Tea Party Princess‘ Top Ten Tuesday post – all YA Shot authors! Check out Mel of The Book Moo‘s YA Shot Readathon TBR vid! Check out Michelle of Fluttering Butterflies‘ vlog review of Dawn Kurtagich’s Dead House! Stop #28 (September 25th) – Michelle of Tales of Yesterday interviews Alison Rattle: Libraries, bubbles and camels?! Check out SomethingLikeLydia‘s YA Readathon TBR Pile post. Stop #38 (October 8th) – Sabrina of The Delirious Reader interviews The Spinster Club from Holly Bourne‘s Am I Normal Yet? Extra YAShot-related BookTube vid from SomethingLikeLydia: YA Shot Readathon! Extra YAShot-related BookTube vid from SomethingLikeLydia: September Book Haul – YA Shot! Stop #42 (October 12th) – Beth of Bibliobeth interviews Piers Torday about The Last Wild series. Plus check out her reviews of The Last Wild, The Dark Wild and The Wild Beyond too! Stop #44 (October 14th) – Beth of Bibliobeth interviews Jane Elson about How to Fly with Broken Wings. And check out her review here!! Check out Elena’s latest booktube vid – part of the YA Shot Readathon organised by Michelle! Check out The BOOk Moo Mel’s review of James Dawson‘s Under My Skin! Check out all the fantastic reviews on Michelle of Fluttering Butterflies‘ YA Shot Readathon here! Check out this brilliant ‘Boy and a biscuit‘ post about Emma Haughton‘s Better Left Buried from her editor, Sarah Stewart! Huge thanks to uber-talented Luna of Luna’s Little Library for the amazing YA Shot Blog & Vlog Tour Banners.